رحمانی, علیرضا, اکبری, سمیه, زمانی, فهیمه, معصومی, زینب, هراتی, رویا, الماسی, حلیمه, شعبانلو, امیر. (1395). بررسی مقایسه‌ای راندمان فرایند الکتروپرسولفات و فرایند الکتروفنتون در حذف فنل از محیط‌های آبی. مجله آب و فاضلاب, 27(5), 38-45. علیرضا رحمانی; سمیه اکبری; فهیمه زمانی; زینب معصومی; رویا هراتی; حلیمه الماسی; امیر شعبانلو. "بررسی مقایسه‌ای راندمان فرایند الکتروپرسولفات و فرایند الکتروفنتون در حذف فنل از محیط‌های آبی". مجله آب و فاضلاب, 27, 5, 1395, 38-45. رحمانی, علیرضا, اکبری, سمیه, زمانی, فهیمه, معصومی, زینب, هراتی, رویا, الماسی, حلیمه, شعبانلو, امیر. (1395). 'بررسی مقایسه‌ای راندمان فرایند الکتروپرسولفات و فرایند الکتروفنتون در حذف فنل از محیط‌های آبی', مجله آب و فاضلاب, 27(5), pp. 38-45. رحمانی, علیرضا, اکبری, سمیه, زمانی, فهیمه, معصومی, زینب, هراتی, رویا, الماسی, حلیمه, شعبانلو, امیر. بررسی مقایسه‌ای راندمان فرایند الکتروپرسولفات و فرایند الکتروفنتون در حذف فنل از محیط‌های آبی. مجله آب و فاضلاب, 1395; 27(5): 38-45. فنل یا هیدروکسی بنزن یکی از هیدروکربن‌های آروماتیک سمی است. این ترکیب از طریق دفع فاضلاب تعدادی از صنایع باعث آلودگی محیط زیست و به‌ویژه منابع آبی می‌شود. در این پژوهش حذف فنل در محلول‌های آبی به‌روش الکتروپرسولفات و الکتروفنتون با استفاده از الکترود آهن مورد مطالعه قرار گرفت. در این پژوهش، یک راکتور منقطع الکتروشیمیایی در مقیاس آزمایشگاهی مجهز به چهار الکترود و منبع برق مستقیم مورد استفاده قرار گرفت. 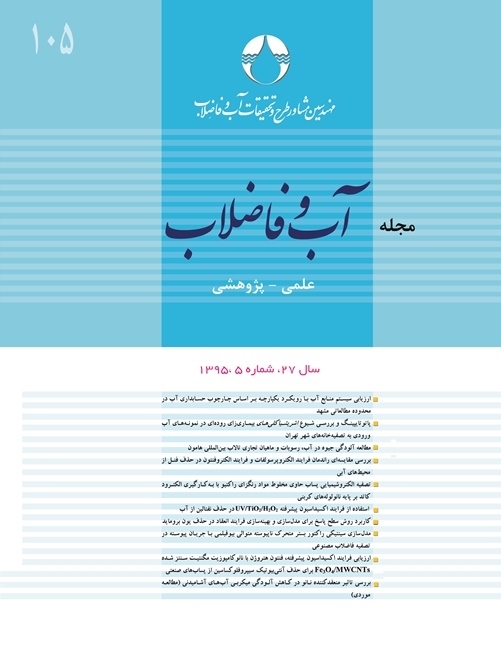 در آزمایش‌های انجام شده اثر پارامترهای مؤثر عملیاتی مانند pH اولیه، دانسیته جریان و غلظت اولیه فنل، غلظت اولیه پراکسید هیدروژن و پرسولفات بر راندمان حذف فنل بررسی شد. نتایج نشان داد که فرایند الکتروپرسولفات و الکتروفنتون قادر به حذف فنل با راندمان 18/95 و 99/93 درصد در شرایط عملیاتی pH برابر 3، غلظت اولیه فنل 100 میلی‌گرم در لیتر در غلظت 4/0 میلی‌مولار پراکسید هیدروژن و پرسولفات با دانسیته جریان 07/0 آمپر در دسی‌متر مربع در زمان 45 دقیقه می‌باشند. همچنین با افزایش مقدار پرسولفات و پراکسید هیدروژن از 4/0 به 8/0 میلی‌مولار در فرایند الکتروپرسولفات و الکتروفنتون به‌ترتیب راندمان از 18/95 و 99/93 به 43 و 85 درصد کاهش پیدا کرده است. نتایج پژوهش نشان می‌دهد که فرایندهای الکتروپرسولفات و الکتروفنتون در حذف فنل دارای راندمان حذف یکسانی بوده و به‌طور کلی تلفیق فرایند الکتروشیمیایی و پرسولفات به‌منظور تولید الکتریکی آهن و فعال‌سازی پرسولفات دارای توانایی بیشتری در مقایسه با استفاده مجزا از این فرایندها است. Phenol, or benzene hydroxyl is a toxic aromatic hydrocarbon discharged into the environment through certian industrial effluents which, thereby, pollute water resources. This study examines phenol removal from aqueous solutions through electro-Fenton and electro/persulfate processes using iron electrodes. For this purpose, a laboratory-scale electrochemical batch reactor was used that was equipped with four electrodes and a direct DC power supply. In the tests carried out, the effects of operational parameters such as initial pH; current density; and initial concentrations of phenol, hydrogen peroxide, and persulfate on the removal of phenol were investigated. The results showed that EPS and EF processes achieved phenol removal efficiencies of 95.18% and 93.99%, respectively, at operating conditions of pH = 3, initial phenol concentration of 100 mg/l, hydrogen peroxide and persulfate concentration of 0. 4 mM, and a current density 0.07A/dm2 over 45 min. Increasing persulfate and hydrogen peroxide concentration from 0.4 to 0.8 mM reduced phenol removal efficiencies from 95.18% and 93.99% to 43% and 85%, respectively. Generally speaking, EPS and EF processes exhibited almost identical phenol removal efficiencies. Finally, the integrated electrochemical and persulphate process was found to be more productive in producing electrical iron and persulphate activation than using each single process in isolation. 1. Busca, G., Berardinelli, S., Resini, C., and Arrigh, L. (2008). “Technologies for the removal of phenol from fluid streams: A short review of recent developments.” J. of Hazardous Materials, 160(2), 265-288. 2. Babuponnusami, A., and Muthukumar, K. (2011). “Degradation of phenol in aqueous solution by fenton, sono‐fenton and sono‐photo‐fenton methods.” CLEAN–Soil, Air, Water, 39(2), 142-147. 3. Abdelwahab, O., Amin, N. and Ashtoukhy, Z. (2009). “Electrochemical removal of phenol from oil refinery wastewater.” J. of Hazardous Materials, 163(2), 711-716. 5. Santos, A., Santos, Y. P., Gomis, S., and Ruiz, G. (2006). “Reaction network and kinetic modeling of wet oxidation of phenol catalyzed by activated carbon.” Chemical Engineering Science, 61(8), 2457-2467. 6. Karimi, A., Mahdizadeh, F., and Eskandarian, M. (2012). “Enzymatic in-situ generation of H2O2 for decolorization of acid blue 113 by fenton process.” Chemical Industry and Chemical Engineering Quarterly, 18(1), 89-94. 7. Fan, Y., Ai, Z., and Zhang, L. (2010). “Design of an electro-fenton system with a novel sandwich film cathode for wastewater treatment.” Journal of Hazardous Materials, 176(1), 678-684. 8. Seid Mohammadi, A., Mehralipour, J., Shabanlo, A., and Mobarakian, A. (2013). “Comparing the electrocoagulation and electro- fenton processes for removing nitrate in aqueous solution for Fe electrodes.” Journal of Mazandaran University of Medical Sciences, 23(104), 56-67. 9. Lacasa, E., Cañizares, P., Sáez, C., Fernandez, F., and Rodrigo, M. (2011). “Removal of nitrates from groundwater by electrocoagulation.” Chemical Engineering Journal, 171(3), 1012-1017. 10. Malakootian, M., Asadi, M., and Mahvi, A. (2013). Evaluation of electro-fenton process performance for COD and reactive blue 19 removal from aqueous solution.” Iranian Journal of Health and Environment, 5(4), 433-444. (In Persian). 11. Hou, L., Zhang, H., and Xue, X. (2012). “Ultrasound enhanced heterogeneous activation of peroxydisulfate by magnetite catalyst for the degradation of tetracycline in water.” Separation and Purification Technology, 84 (0), 147-152. 12. Khataee, A. (2009). “Application of central composite design for the optimization of photo-destruction of a textile dye using UV/S2O8 2-process.” Polish Journal of Chemical Technology, 11 (4), 38-45. 13. Li, S-X., and Hu, W. (2011). “Decolourization of acid chrome blue K by persulfate.” Procedia Environmental Sciences, 10, 1078-1084. 14. Ghauch, A., Ayoub, G., and Naim, S. (2013). “Degradation of sulfamethoxazole by persulfate assisted micrometric Fe0 in aqueous solution.” Chemical Engineering Journal, 228(0), 1168-1181. 15. Ghauch, A., Tuqan, A.M. (2012). “Oxidation of bisoprolol in heated persulfate/H2O systems: Kinetics and products.” Chemical Engineering Journal, 183 (0), 162-171. 16. Lin, Y-T., Liang, C., and Hen, J.H. (2011). “Feasibility study of ultraviolet activated persulfate oxidation of phenol.” Chemosphere, 82(8), 1168-1172. 17. Xu, X-R., and Li, X-Z. (2010). “Degradation of azo dye orange G in aqueous solutions by persulfate with ferrous ion.” Separation and Purification Technology, 72 (1), 105-111. 18. Oh, S-Y., Kang, S-G., and Chiu, P-C. (2010). “Degradation of 2, 4-dinitrotoluene by persulfate activated with zero-valent iron.” Science of the Total Environment, 408(16), 3464-3468. 19. Wu, J., Zhang H., and Quin, J. (2010). “Degradation of acid orange 7 in aqueous solution by a novel electro/Fe2+/peroxydisulfate process.” Journal of Hazardous Materials, 215-216(0), 138-145. 20. APHA, AWWA, WEF. (2005). Standard methods for the examination of water and wastewater, 21st Ed., American Public Health Association (APHA), Washington, D.C.
21. Masomboon, N., Ratanatamskul, C., and Lu, M. (2010). “Chemical oxidation of 2, 6-dimethylaniline by electrochemically generated Fenton's reagent.” Journal of Hazardous Materials, 176(1-3), 92-98. 22. Wang, C.T., Chou, W.L., Chang, M., and Kuo, Y. (2010). “COD removal from real dyeing wastewater by electro-fenton technology using an activated carbon fiber cathode.” Desalination, 253(1), 129-134. 23. Zhou, M., Yu, Q., Lei, L., and Barton, G. (2007). “Electro-fenton method for the removal of methyl red in an efficient electrochemical system.” Separation and Purification Technology, 57(2), 380-387. 24. Nidheesh, P.V., and Gandhimathi, R. (2012). “Trends in electro-fenton process for water and wastewater treatment: An overview.” Desalination, 299 (0), 1-15. 25. Shemer, H., and Linden, K.G. (2006). “Degradation and by-product formation of diazinon in water during UV and UV/H2O2 treatment.” Journal of Hazardous Materials, 136(3), 553-559. 26. Ramirez, J.H., Duarte, F.M., Martins, F.G., and Costa, C.A. (2009). “Modelling of the synthetic dye Orange II degradation using fenton’s reagent: From batch to continuous reactor operation.” Chemical Engineering Journal, 148(2-3), 394-404. 28. Zhou, L., and Zheng, W., (2013). Ferrous-activated persulfate oxidation of arsenic (III) and diuron in aquatic system.” Journal of Hazardous Materials, 263, 2(0), 422-430. 29. Rao, Y.F., Qu, L., Yang, H., and Chu, W. (2014). “Degradation of carbamazepine by Fe(II)-activated persulfate process.” Journal of Hazardous Materials, 268, 23-32. 30. Li, C-W., Chen, Y-M., Chiou, Y.C., and Lin, C.K. (2007). “Dye wastewater treated by fenton process with ferrous ions electrolytically generated from iron-containing sludge.” Journal of Hazardous Materials, 144(1-2), 570-576. 31. Daneshvar, N., Aber, S., Vatanpour, V., and Rasoulifard, M.H. (2008). “Electro-fenton treatment of dye solution containing Orange II: Influence of operational parameters.” Journal of Electroanalytical Chemistry, 615(2), 165-174. 32. Mollah, M.Y., Pathak, S.R., and Patil, P.K. (2004). “Treatment of Orange II azo-dye by electrocoagulation (EC) technique in a continuous flow cell using sacrificial iron electrodes.” Journal of Hazardous Materials, 109 (1),165-171. 33. Ting, W-P., Lu, M-C., and Huang, Y.H. (2009). “Kinetics of 2, 6-dimethylaniline degradation by electro-fenton process.” Journal of Hazardous Materials, 161(2-3),1484-1490. 34. Hou, L., and Zhang, H., and Xue, X. (2012). “Ultrasound enhanced heterogeneous activation of peroxydisulfate by magnetite catalyst for the degradation of tetracycline in water.” Sepecific Purifation Technology, (84), 147-152. 36. Boukari, S.O., Pellizzari, F., and Karpel Vel Leitner, N. (2011). “Influence of persulfate ions on the removal of phenol in aqueous solution using electron beam irradiation.” Journal of Hazardous Materials, 185(2), 844-851. 37. Zazouli, M.A., and Taghavi, M. (2012). “Phenol removal from aqueous solutions by electrocoagulation technology using iron electrodes: Effect of some variables.” Journal of Water Resource and Protection, 4(11), 980-983.